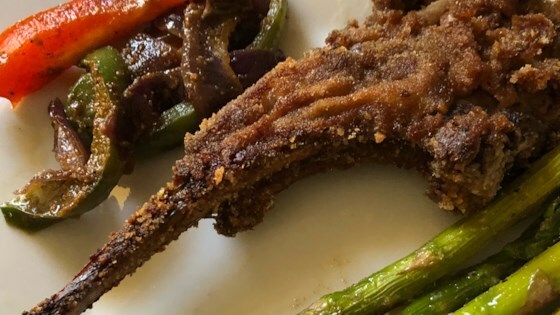 "I found a lot of great recipes out there for grilled lamb chops but only one for breaded, and it didn't have a lot of flavor. So I came up with this easy recipe myself a few years ago. It's bursting with flavor and has become a comfort food staple in our home. Use plain or Italian bread crumbs. We like it with a Caesar salad and garlic mashed potatoes." Mix together Worcestershire sauce, soy sauce, garlic and rosemary in a non-reactive bowl. Place the lamb chops in the marinade and turn. Refrigerate, uncovered, for 1 1/2 to 3 hours, turning once or twice. Preheat oven to 375 degrees F (190 degrees C). Grease a 13x9x2-inch glass baking dish. Remove lamb chops from marinade and set them aside. Discard the rosemary sprig. Whisk eggs into the leftover marinade. Spread breadcrumbs on a large plate. Dip lamb chops into the egg/marinade mixture, then into the bread crumbs, coating evenly. Place the breaded chops into the prepared baking dish. Discard marinade/egg mixture. Bake for 20 minutes and turn chops over. Bake for 15 more minutes or to desired doneness. I thought this recipe was great. I used half soya sauce and half Worchestershire. I also used crushed corn flakes instead of bread crumbs. The lamb was very tender! Excellent!!! Did it twice, and will do again. My husband love it as well. More the meat stays in marinade more tender it is. Followed exactly as written. Whoever loves lamb should try it. I cut the w-sauce in half and loved the recipe! This was very tasty & very easy~ thanks for posting!